This sort of book is a really great way to reap the benefits of some of the great people in the history of the church. 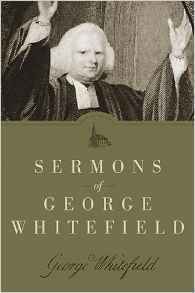 George Whitefield, an Englishman and evangelist, is best known for his preaching ministry during the Great Awakening of the 1700’s. Whitefield crossed the Atlantic at least seven times and had hugely successful revivals on both sides. He was a great friend of John and Charles Wesley in England and Jonathan Edwards in America. His life in itself is an interesting story, and the most enduring part is his sermons. This book gathers twenty-nine sermons from one of the greatest preachers in the history of the church. It is said that when Jonathan Edwards heard Whitefield preach at his church, he sat on the front row and wept. Benjamin Franklin, no great friend to evangelical Christianity, was highly impressed by Whitefield’s ability to project his voice and his ability to appeal to people so well. It is said that on one occasion when Franklin went to hear Whitefield because he knew Whitefield would appeal to the crowd for money for an orphanage he sponsored and because Whitefield was so persuasive, Franklin purposefully left his wallet at home. When Whitefield made his expected appeal, Franklin was so overwhelmed by his duty to give that he borrowed money from someone in the crowd so that he could give to Whitefield’s orphanage. Each of the sermons is around ten to fifteen pages, so the book can be read in multiple sittings with great benefit from each sermon read. No Christian is without their faults and Whitefield certainly had his (including his central role in institutionalizing slavery in Georgia), but his evangelistic preaching deserves to be continually reread. While reading you can imagine a preacher with an English voice speaking to crowds in the thousands without any kind of amplification and bringing people of all walks of life to the point of conviction. Whitefield was used by God greatly during his own lifetime and, through works like this, he can be used during ours.